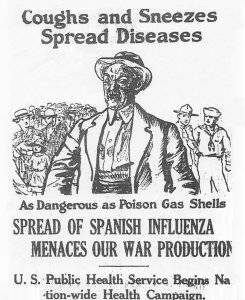 The Historical Society currently is featuring an exhibit on the Spanish Flu pandemic that swept the world one hundred years ago this month. 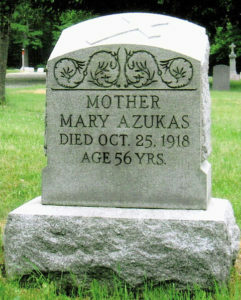 Schuylkill County, being part of the world, was not immune and the disease resulted in a large number of fatalities. The flu began in the spring of 1918 but the peak of its brutality was felt from mid-September through mid-November, which means that the month of October was the most dreadful month of the year with approximately 100,000 deaths occurring in the United States. Records indicate that in September when the flu was noticeably present in Schuylkill County the numbers of those stricken rose rapidly from a few to the many. According to the Schuylkill Haven Call, Schuylkill Haven had 60 deaths. Other communities were hit much harder. Minersville was hit hard; about 1,200 cases with 300 deaths. St. Clair had over 200 and Frackville 175. My great-grandmother, Mary Azukas, of Shenandoah, died of the flu. Dr. Lessig, a Schuylkill Haven physician, in a newspaper interview, reportedly made 104 house calls within a 24-hour span with some homes having multiple victims. The hospitals in Pottsville were unable to handle the number of cases. Alice Milliken opened up her mansion on Greenwood Hill as a make-shift hospital with fifty beds brought into the home. The Pottsville Hospital on North Centre Street was also converted to a medical center with one hundred beds. At the Reading Anthracite Building (P&R C&I) at Second and Mahantongo, a temporary morgue was set up. Another temporary hospital was set up near the Almshouse (Rest Haven) south of Schuylkill Haven. The death toll in Schuylkill County was reported to be over 1,600 with his victims all ages and walks of life. The number of deaths worldwide varies wildly from between 20 million to 100 million. However, the United States Center for Disease Control estimated the world wide death toll to be “at least” 50 million with about 675,000 deaths occurring in the United States. The Exhibit at the Historical Society will give you a glimpse of the flu’s brutal presence in the County with some artifacts from the local hospitals and the telegraphs sent urging more assistance. Girardville native Cardinal Dennis Dougherty, the Archbishop of the Philadelphia Catholic Diocese, played an important role in getting aid to his native county. John O’Hara, the famed novelist from Pottsville was inspired by the epidemic to pen his acclaimed tribute to his father, Dr. Patrick O’Hara. Come to the museum and learn about the pandemic at this limited engagement. While the Spanish Flu Exhibit is in the center hall, you have one last opportunity to see a large portion of the well-received WWI Exhibit in the Main Room before it is disassembled. The Exhibit was sponsored by the Schuylkill County Bar Association in honor of colleague, Attorney Robert Woodbury, who died in combat. WWI, often referred to as “The Great War,” ended on the battlefield on November 11, 1918 (“the eleventh hour of the eleventh day of the eleventh month”) which is referred to as Armistice Day, marking victory over Germany. The Treaty of Versailles signed on June 28, 1919 after six months of negotiations which involved Pottsville native Birch Helms, was the formal end of the war. In the Schuylkill Room new artifacts and pieces are added regularly. Famed sculptor Martin Heffron brought a nostalgic Necho Allen Hotel “coal car” back to life. He also sculpted a football out of a piece of timber from the St. Nicholas Breaker honoring the Pottsville Maroons football team. Both the team and the breaker remain only in memory. Also, noted artist Nannette Brophy-Major created a true masterpiece with her ingenious map of the old Centre Turnpike. The original is on display in front of an oversized reproduction which brightens up the room. Copies of Centre Turnpike map are available for purchase in the gift shop and will make a fine present for holidays or birthdays. On September 15th over 35 people toured the Museum which is a record for a single day. Of course, this spike in interest is attributed to the 1st Annual “Pottsville On Tap” celebration on North Centre Street as well as a visit by some Nativity High School class of 1968. Remember the museum makes a great stop for those in the area for class and family reunions. Lastly, in October the incredible John Walsh will lead multiple “haunted history” walks through downtown Pottsville, telling stories of the supernatural, the macabre and the criminal in his unique style. It is a great opportunity to learn local history, be entertained in a scary way, and burn off calories. Sign up for a tour before it’s too late!